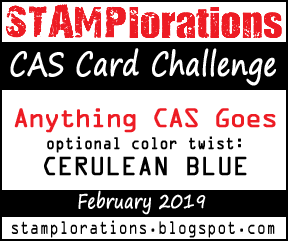 Hey there STAMP fans, today is the start of this months CAS card challenge, the added color twist this time is Cerulean Blue. I have created a card using the Hummingbird-Large and Amazing stamps. I coloured the Hummingbird with Alcohol pens and added a light lilac ink blended background. For a touch of sparkle I used some silver glitter washi tape.